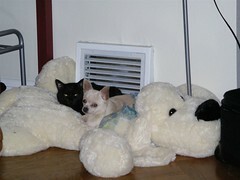 Susie bought Rudy a big soft floppy dog so he could do some lounging in front of the heat vent that he loves so much. I've been home all morning due to a plumbing issue and can confirm that he's spent all but about 10 minutes there. As of about 5 minutes ago, the cat has joined him, and I don't expect either of them to get up any time today. I miss Rudy! And you guys! that is so damn cute!!!! not ONLY can i not stop looking at it, but i am ridiculously jealous of the animals.